For Ignatius, and for many within the Church at this time (especially the bishops and the apostles before them), this endurance meant certain death; it meant becoming a Christian and receiving the calling from God to ministry, knowing full well that it was a calling to martyrdom. What I really want to do today is remind us all that being a Christian is about dealing with death. And there are two kinds of death – one good, and one bad. The bad kind of death is what the Lord once referred to when speaking to the apostle Peter. He tells him that the “Gates of Hades” will never prevail against His Church. Hades was the place of the dead – the place of death – and all death is a result of schism. Adam and Eve shared full communion and fellowship with God in the beginning, before their schism separated them from intimacy with Him, bringing death to us all. Their schism was choosing to do things their own way, ignoring what God had commanded and ignoring where He had placed them in this life. This is the bad kind of death – the death of schism; the death of selfishness and self-centeredness; the death that is a tragic participation in and re-enactment of mankind’s fall in the Garden. We should never desire, as Christians, to partake of such death, because it is against the message of the Gospel. Incidentally, in all of Saint Ignatius’ letters, he seems to be primarily concerned with the same exact thing – good death and bad death. Of the bad death of schism, he writes: “look upon the bishop even as we would upon the Lord Himself.” He tells them to make sure “no sect has any dwelling-place among you.” He says: “Let us be careful, then, not to set ourselves in opposition to the bishop, in order that we may be subject to God.” These types of statements are found repeatedly in his letters, and the message is always the same: Seek unity above all. Do whatever it takes to dwell together in love and fellowship. Never cause a schism or a rift in the Church. On the other hand, Ignatius speaks at length about the “good” kind of death: the death of martyrdom; the death that is true life. In fact, Ignatius speaks of Jesus as the “one Physician” who is “true life in death.” No doubt, it was precisely because of the example that Christ gives us that Ignatius was willing to endure the death of a martyr. One of the worst ideas spread among Christians in our day is this idea that Christ suffered so that we wouldn’t have to; that the Gospel is all about making our lives easier or better in some earthly way. But that isn’t Christianity. Christianity is about dying to this life so that we can live the true life that is found in Christ and in His kingdom – and as our will is conformed to that of Christ’s, we might even learn to enjoy this greater life every once and awhile. 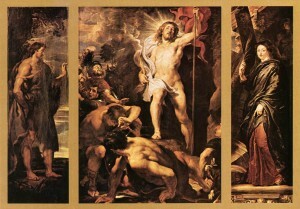 The apostle Paul says in his letter to the Romans that we can only be joint heirs of Christ “if indeed we suffer with Him.” Jesus didn’t suffer so we wouldn’t have to; He suffered so that we could handle suffering with Him – and through that suffering, we will be raised to walk in the true life of the resurrection, just as He was. In the book of Revelation, Jesus is called the Great Witness, and this word “witness” in Greek is where we get the word “martyr.” Jesus was the first, true martyr, and we are all called to be his martyrs/witnesses in this life. We are all called to martyrdom – to the death that leads to true life. Now, for most of us, that martyrdom will not be literal. It will be far less obvious than being burned to death or being fed to wild animals. It will be those choices we make every day; the relationships we have; the thoughts that we either let take us captive or that we suppress and overcome. The Church was founded on martyrdom, and it has been preserved likewise. In the early days, before Christianity was legalized, the Christians would worship in one of two places: in somebody’s home or in a mausoleum. They would gather around an altar that was the tomb of a martyr and celebrate the liturgy and partake of the Eucharist above the martyr’s bones. This way of worship paved the way for Christian liturgy and worship in the centuries to come, and it helps us understand why all of our altars are consecrated down to this very day with the relics of a Saint. Death has always been a central theme in the life and worship of the Church, and even though – at present – we are not often faced with literal martyrdom, we must always keep this in mind, and be willing to face it. At the heart of martyrdom is a desire to forgo the temptations and pleasures of this life for the far more important life of eternity. This does not mean our present life is meaningless. What it means is that this life is a time of preparation. And this is really what asceticism is all about – not “meriting” God’s favor or punishing one’s self, but preparing for the life of the kingdom (including its diet, where death is no more). I’m assuming that bacon will grow on trees, but I don’t know how all that works. In closing, I want us to remember that our true life is found in the kingdom of God, even as we are living in this world and especially within the Church. Salvation isn’t about becoming someone unnatural or super-natural, it is about becoming a true human being, just as we were intended to be. Saint Polycarp, who was a fellow bishop and friend of Ignatius, also died as a martyr, being burned at the stake and finally impaled when the fire would not consume him. As he was entering the stadium to be killed, the voice of God came to him, saying: “Be strong, and show yourself a man!” The message was not “Be strong, and show yourself a Saint!” or “Be strong, and show yourself an angel!” The message was “show yourself a man!” – show yourself to be a true man; a true person; a true human being – just as Jesus Christ did as the first and great Martyr. While we are all called to different trials and forms of martyrdom in this life, we must pray that all of us could be so bold as to face it willingly and to truly share in the sufferings of Christ, being therefore found to be the true people of God. Gabriel Vincent Martini has a BA in Philosophy from Indiana University and resides in northwest Arkansas. He is a layperson in the Orthodox Church (Antiochian).